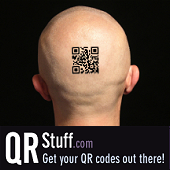 Space geeks rejoice! In follow-up to NASA’s widely popular debut iPhone app … the cleverly named – NASA App [iTunes Free] … the NASA Lunar Electric Rover Simulator [iTunes Free] iPhone game landed on the App Store today (ouch, that doesn’t sound right)! 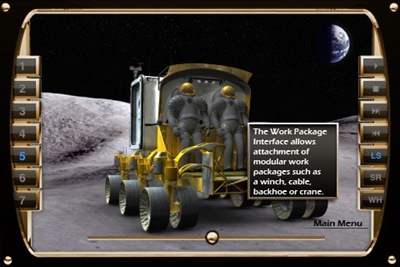 Both armchair astronauts and common folks alike will love this simulated joy ride on the moon and being tasked with various missions to complete. While gameplay controls resemble Pac-Man … left, right, forward and reverse … the game presents plenty of unique challenges before the words “Mission Accomplished” are awarded. Just like real-life astronauts, proper navigation and attention to power consumption are the keys to success while driving in space. 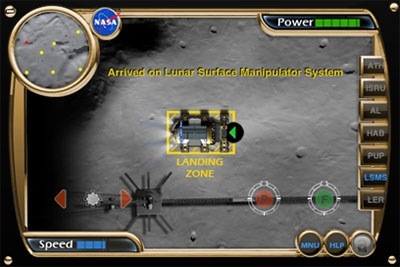 NASA Lunar Electric Rover Simulator is not only a mouthful to say, but filled to the brim with extra goodies. 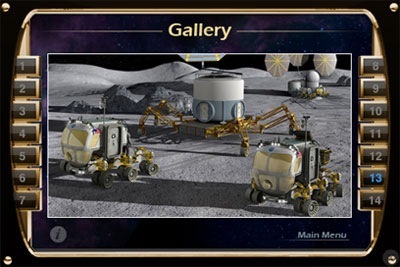 The Gallery section of the app features 14 images of various Lunar Electric Rovers with facts about each. The interactive Learn section takes a closer look at the rover, complete with informational call-outs. 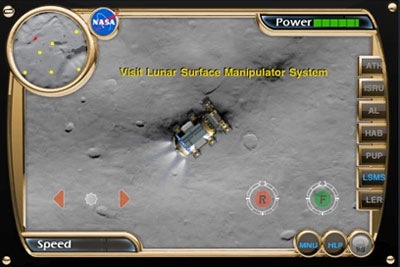 Couple all this with groovy spacey in-app music, the NASA Lunar Electric Rover Simulator app should quickly makes its way into the Overall Top 50 Free apps. But aside from all these killer features, for us, the best asset of NASA’s first-fever iPhone game is its wiseass remarks. 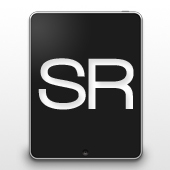 For example, if you happen to crash the rover, you’ll receive a sarcastic mocking … “you’re the reason we had to remove that annoying reverse beeper!” LOL … there are plenty of more zingers available to discover, so rather than be a spoiler … just download the free rover simulator app immediate fun. Thank you very much for the positive review! 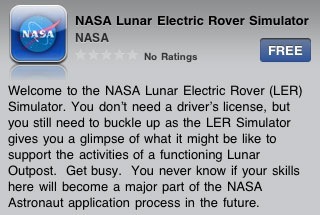 Hope everyone enjoys the NASA LER iPhone/iPod Touch app. 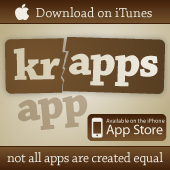 anti-KRAPS. Great job on this marvelous game! LOL … be careful what you say!